Each book in this quartet features a different protagonist connected by the same school and town, but characters from the other books overlap. Readers can experience or "remember" some of the same events from different points of view in different books, but each story is unique, and each book can be read and understood without reading another book in the quartet first. Marley is saving money to go to the upcoming Star Trek convention, and it isn't that he is superstitious, exactly, but he sometimes carries particular Star Trek action figures in his pocket, depending on the kind of luck he needs in a given day. Starting 7th grade isn't looking great, especially since his former best friend, Stanford, suddenly became Mr. Popular Athlete. Having Digger Ronster lurking around to bully him at every opportunity doesn't help. Is it some sort of requirement to be miserable all through middle school? 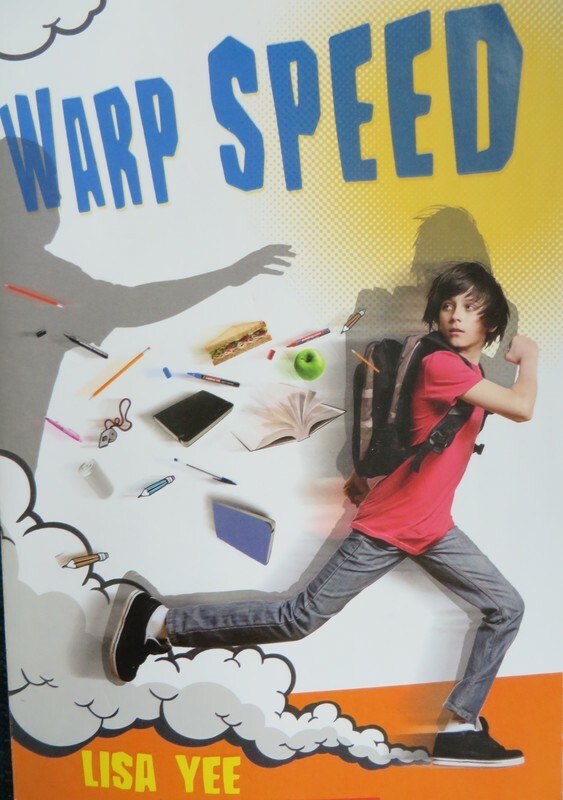 When it turns out that Marley is a pretty fast runner, does it mean he should use his talent as a ticket to popularity? How can he stay true to himself? I'm very fond of this series, and particularly of this book. Even if a reader isn't a Star Trek fan, the book works for anyone who's ever felt shoved to the side, unsure about how to find a place to fit. Readers who are Star Trek fans will quite appreciate Marley's explanation that he can't tell anyone why he doesn't have his homework - "it's the Kobayashi Maru!" Lisa Yee does middle school voice and internal monologue exceptionally well, and her characters feel real and distinctive. Marley isn't a stereotype Trekkie - he is his own person, and yet we can instantly connect to the awkward kid in the AV Club who wishes his parents had a little more money and that he had a little more control over his world. A clever look at bullying and social structures in school - a bit like The Chocolate War, but much lighter and with more humor. I adore this book. Millicent is young, brilliant, and lonely. She adores new ideas and learning, and in her first college class this summer (she's eleven), she is excited to finally be with similarly motivated peers. While the professor is like-minded, the other students are not. Forced to tutor Stanford, the basketball-playing family friend, and forced to sign up for volleyball (the worst! ), Millicent decides not to confess her grade acceleration to her new friend, Emily. Just once, she wants a friend who isn't put off by all the ways Millicent is different. Stanford can't wait to go to basketball camp this summer but his failing grade means he has to attend summer school, and worse! - actually read books. His genius older sister is at college, his father has no time for him, and his grandmother is becoming forgetful. His best friend doesn't talk, and one of the kids in his group of friends makes him uncomfortable - what if he found out that Stanford flunked? There's a new girl in town named Emily, and Stanford thinks she's the greatest, except for her friendship with his English tutor, Millie. Millie is definitely the opposite of great. This book is not as funny as Warp Speed, but it's well-written and it's a good story. Emily is new to Rancho Rosetta. She's living with her mom, who has not-so-subtle hints about how she can reduce her weight, and who is certainly responsible for the fact that her father doesn't live with them right now - but Emily is certain he'll be coming back for her. As the new girl in town, Emily relies on confidence and kindness to meet new people, like her friend, Millie, who also happens to hate volleyball, or that nice boy, Marley, or that cute guy, Stanford. She brushes off the mean girls and figures it's just a new school, right? How hard can it be? Lisa Yee has an amazing talent for incorporating details into her books that other writers miss - crossing ribbons over the bulletin board to hold your photos, for example. I love how each of the four protagonists are such different people, but the details make each one believable. Emily is a great character in that she is so confident with peers - she appears not to care what others think. Emily is slightly frustrating as an unreliable narrator, because there are things you wish she would recognize and be more self-aware about. This particular book title may not be as appealing off the shelf since the title language is outdated, but anyone who loves the painfully sweet authenticity of middle school realistic fiction will feel lucky to find (and re-read) this series.